There have been many responses to these proposals saying that the law is OK as it stands. But that is nonsense, and lawyers are the wrong people to make the judgment! The current law is confusing and is of no use when it matters, in the heat of the action. After studying the current law and its interpretation, I don’t understand it. I don’t know how the police or a court would interpret “proportionate force”. And if I don’t understand it now, how can I hope to behave in such a way that I escape prosecution later? What lawyers understand the law to be is irrelevant at action-time. If lawyers want to help, they need to provide simple unambiguous guidelines for the lay-person before they are needed. Whether the intruder has weapons (and would use them)? 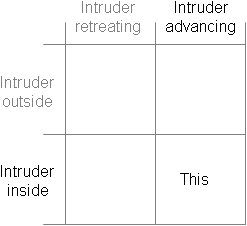 Does the intruder have instability (for example as a result of drugs) that will preclude a rational action? Is the intruder devious, and would attempt to lull the householder into a false sense of security? What the householder needs is the broadest scope for avoiding all of these these, consistent with human rights of all concerned and with other laws considered essential. This isn’t a game where two people are participating after agreeing to such rules. It is a one-sided situation where one person could have decided to avoid injury to both of them, and the other has been left with no acceptable choice. “Householders have the right to use force to get rid of the burglar…. occasionally it looks as if the householder is the criminal…. Well, the householder is not in a position to exercise calm, cool, judgment. You’re not calmly detached, you’re probably very cross and you’re probably very frightened, a mixture of both. And your judgment of precisely what you should or should not do in the circumstances cannot – as another predecessor of mine said, Lord Lane – you can’t measure it in a jeweller’s scale. You have to face the reality of how people are and how people react to these situations, and justifiably react…. measuring whether force was reasonable or not was not simply “a paper exercise six months later”, and the circumstances at the time needed to be considered”. Do whatever is thought necessary to stop the intruder advancing. Every continued advance should be assumed to be strong evidence of malicious intent, and obviously increases the intruder’s options for committing harm. Every retreat by the householder reduces the householder’s future options, and obviously escalates the personal risk of serious injury or death. The intruder must stop advancing or be stopped. (A pause by the intruder is ambiguous, and may precede either an advance or a retreat). Given the alternatives: “intruder injured or dead, me in court” and “me injured or dead, intruder in court”, my choice is blindingly obvious! What I hope is to avoid both injury/death and court. And at any stage, the intruder retains the human right to life by having the ability to retreat. What do we want? A plastic bag charge! When do we want it? Now! Police and Crime Commissioners election – decisions, decisions!